Ever come back from a winter ride and your feet are so cold you want to cry? That happened to me for years… until I discovered wool socks! Wool socks alone won’t prevent frostbite, but they are so cozy and comfortable I can’t imagine wearing anything else in cool weather! 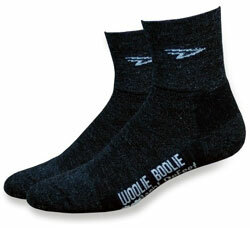 One of my favorite wool socks is the DeFeet Woolie Boolie. Wool is one of my favorite materials, especially when it comes to socks. Wool socks are just plain awesome! Old timers will question your choice, saying something like, “isn’t wool real scratchy and itchy?” Well, it used to be, but not anymore! Today’s wool garments are extremely soft and comfortable, warm, good looking, and durable. The Woolie Boolie socks are no exception. They work in a wide range of temperatures during the fall, winter, and spring. I wouldn’t wear them during the summer, but they seem to regulate heat well so that they are comfortable whether it’s 25 or 55 degrees! I think this is because of the design. It has thicker wool in some places plus Aireator mesh on top of the foot. The cuff length is just right. At 4″, the cuff comes up high enough that it’s above my winter cycling shoes or hiking boots and is long enough to tuck underneath tights to seal out wind… but not so obnoxiously long that they feel like shin pads. It doesn’t slide down, either, so you never have to adjust them. Comfort! I can’t say enough about the comfort of these socks! 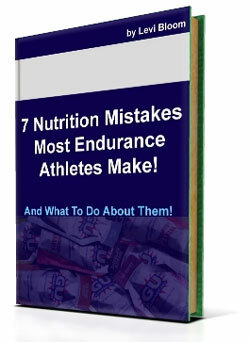 They are extremely soft and utilize a nearly seamless design. From now on I might forget about other brands and just wear Woolie Boolies every day during the winter! Easy to care for. While most of my cycling garments recommend hand wash and hang dry, these Defeet socks are easy. “Machine wash cold, tumble-dry low, no chlorine bleach.” So you just throw them in the washing machine! You could hand wash them, but they seem plenty durable enough for the washing machine, so do whatever you want. Made in the USA. It’s so hard to find anything made in the USA these days. Nothing against China and Taiwan, but sometimes you just want to wear something made in your own country! I wear shoe size 11.5 or 12, so I got size Large in these socks, which is for shoe sizes 9.5 – 11.5. It was a perfect fit! While I haven’t worn every wool sock out there, these Defeet Woolie Boolies are my current favorite wool sock. I wear them for running, hiking, and biking, but I love them so much it’s not unusual for me to wear them all day long! For $12, I recommend grabbing a couple pairs of these for cool and cold weather. How does this product compare to the DeFeet Blaze? The Blaze has been my go-to sock for winter riding. The Woolie Boolie and Blaze look very similar. The Blaze could be a bit thicker though. I’ll have to try the Blaze and compare. We have been using these socks for the past month and have found them to be excellent!